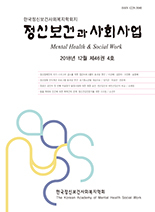 김희영, 조미경,(2015).청소년 인터넷중독 집단치료프로그램 효과에 대한 메타분석.정신보건과 사회사업,43(2),89-118. 본 연구는 인터넷중독 청소년을 대상으로 하는 인터넷중독 집단치료프로그램의 효과를 메타분석방법을 통해 평가하고자 하였다. 주제어 ‘인터넷중독’, ‘상담’, ‘프로그램’의 결합으로 RISS, KISS, 뉴논문, KoreaMed 등의 검색사이트에서 인터넷 검색을 통하여 분석논문을 선정하였다. 자료수집은 2000～2014년까지 국내외에서 발표된 학술지 및 석박사 학위논문에 게재된 논문 총 25편을 대상으로 선정하였다. 연구의 주요 결과를 정리하면 다음과 같다. 첫째, 인터넷중독 집단치료프로그램 연구논문의 평균효과크기는 -1.90이었으며, 전체적으로 청소년의 인터넷중독 치료에 상당한 감소효과가 있었다. 둘째, 연구대상자에 따른 집단치료프로그램의 효과크기는 초 · 중 · 고등학생 집단 모두가 상당히 높게 나타났고, 고등학생에서 효과크기가 가장 높았으며, 다음으로 중학생, 초등학생의 순으로 나타났다. 셋째, 프로그램의 유형에 따른 청소년 인터넷중독 집단치료프로그램의 효과크기를 살펴본 결과, 현실치료 기반의 프로그램 개입이 가장 높은 효과크기를 나타내었고, 미술치료를 병합한 통합예술치료는 효과성을 나타내지 않았다. 넷째, 프로그램의 회기수와 1회 프로그램 진행시간은 10회기 이상, 60분 이하의 경우 효과크기가 높은 것으로 나타났다. 다섯째, 인터넷중독 외에 사회심리적 결과변수에 따른 효과크기는 자아존중감, 우울, 충동성의 순으로 나타났다. 본 연구는 청소년의 인터넷중독 집단치료프로그램 연구의 질을 평가하고, 집단치료프로그램의 효과성을 분석하여, 효과적인 프로그램 운영과 후속 프로그램의 개발에 필요한 정보와 지침을 제공하였다는 데 의의가 있다. The purpose of this study was to meta-analyze the effects of internet addiction treatment program for adolescents. To search for the previous studies published between 2000 and 2014, we searched through electronic databases including RISS, KISS, Newnonmun, KoreaMed, PubMed, DBPIA, and American Search Premier, using the search term ‘internet addiction’, ‘counseling’, ‘intervention’, ‘program’, ‘treatment’. We selected a total of 25 publications including journal articles, theses and dissertations which employed a control group design and standardized internet addiction measurement tools. The results are as follows: first, the average score of the effect sizes of 25 programs was -1.70 so that the large effect sizes were found for the internet addiction treatment programs. Second, the highest effect size was found in the high school group compared to the effect size of elementary or middle school. Third, the strong effect size was found in the reality treatment focused program rather than the cognitive-behavioral treatment-focused program. There were no significant effect sizes found in the integrative art treatment. Fourth, the higher effect size was found in the over 10-session programs and less than 60min per session. Fifth, for the effect sizes of outcome variables besides internet addiction, self-esteem, depression, and impulsivity were higher in order.